At the heart of the project is the Center Court Atrium, organized around a basketball court that will serve as a forum for clinics and special events. Visitors glimpse the atrium while ascending in glass elevators. The Honors Ring, the first museum experience in this procession, is suspended within the spherical volume. Surrounding second-floor, galleries frame multiple views into the spherical atrium and Center Court. Intersecting volumes define the building’s exterior. A curved roof spans the retail and museum spaces; a 100-foot-high sphere contains the Center Court; and rectilinear volumes contain the theater and the north and south arcades. 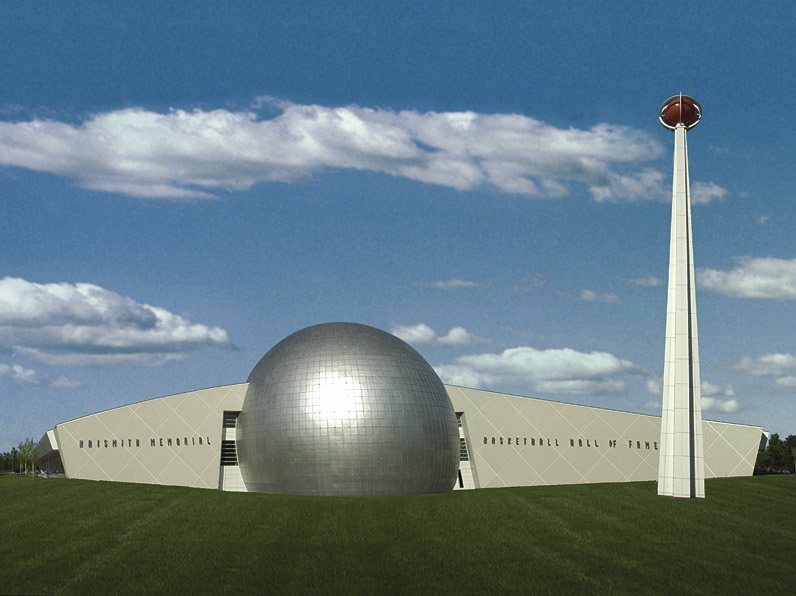 A 150-foot-high spire supports a beacon that incorporates the Hall of Fame’s logo, which illuminates the sphere at night. Events with up to 10,000 visitors can take place in the south parking lot. The museum also includes a tourist information center, a new avatar of the existing Basketball Hall of Fame, a pedestrian bridge over the Amtrak rail lines to Springfield’s Riverfront Park and a pedestrian Walk of Fame connection to downtown Springfield. Associate Architect: Bargmann Hendrie & Archetype, Inc.